Reviews of popular fiction that I've read and enjoyed recently, along with read-alikes and suggestions for additional titles like-minded readers might enjoy. Twenty-three year old Zhuang or "Z" has come to London for a year to learn English so she can assist her parents with their shoe manufacturing business in rural China. 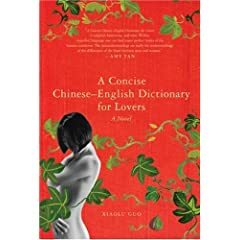 The novel follows Z through that time as she tries to master English, learns to become an individual in a society that offers much more freedom than China and, most importantly, falls in love with a fortysomething Englishman. Her intimate relationship with the unnamed man forms the bulk of the story. The reader sees Z's life through her own eyes--her vocabulary and language skills improve as the book progresses. At times, the novel is heartbreaking (the boyfriend doesn't love Z as much as she loves him) yet humorous (for example, Z's descriptions of british food and customs) and memorable for the depiction of a woman coming into her own. Stay on Top of Pop! I'm a librarian with a background in Reader's Advisory who left librarianship for domestic...uh...bliss. From 1992-2003 I worked at the Downers Grove (IL) Public Library. I served on YALSA's Popular Paperbacks for Young Adults (1998-2000, chair 2000) and Quick Picks for Reluctant Young Adult Readers (2001-2003, chair 2002). I wrote the article "Zap! Woosh! Kerplow! Build High Quality Graphic Novel Collections With Impact" (School Library Journal, January 1997). I am a substitute Adult Services Librarian at the Indian Prairie Public Library and the Downers Grove Public Library.